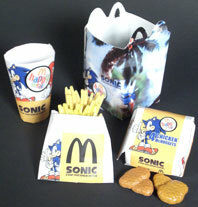 With how popular Sonic was at different times, it's not surprising he had several Fast Food tie-ins. 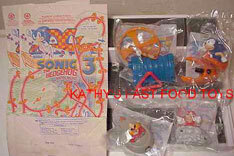 Places like Burger King, McDonalds and even Jack In The Box featured Sonic toys for free in their kids meals. 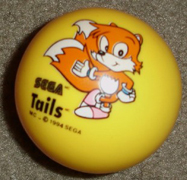 These had various degrees of quality and collectability. 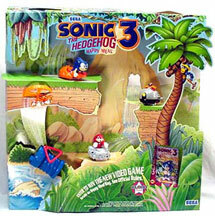 The early ones were just mini action toys that shook, rolled or flew. 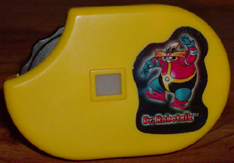 Later on, it switched to mini LCD games, which were actually pretty neat. 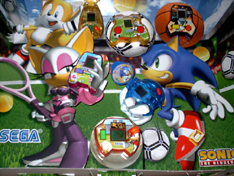 However, since the items were freebie give-aways, they were thrown out a lot, and also not too memorable from exactly which restauraunt they came...The best way to grab these is to go onto Ebay as SOON as a promotion appears in an eatery. Try to buy all of them on one lot. 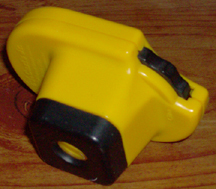 These do not last well, and you'll pay more later on if you don't. 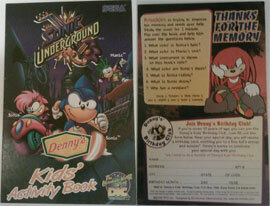 Here's the Denny's Knuckles plush from page 1, but here you can see him better because he's out of the packaging. For a promo doll, he's pretty decent. 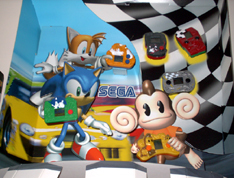 The shoes only have 4 bolts instead of 6, the fists are kind of small...but that seems to be about it. The face and spikes look all right as well. 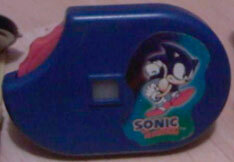 Notice the "Sonic Underground" labeling on the tag there. 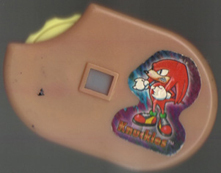 Knuckles DID appear in the show, for only 2 episodes. 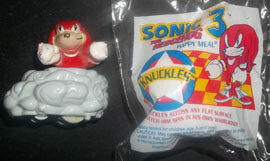 Here's a better look at the Twirling McDonalds Knuckles rolling toy from above. 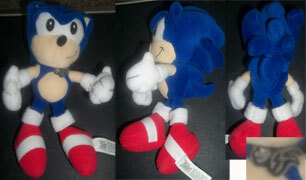 With this turn-around you can see how he looks a little better than the awful art on the bag, but is still somewhat based on it.